The other day Cheryl posted about a couple of her favorite kitchen gadgets and I immediately thought, “ah HA! A Ten on Tuesday topic!” And so, here we go with this new topic 10 Favorite Kitchen Gadgets. Pie crust wheel. Nothing makes a lattice pie crust look prettier than a nice crimped edge. Garlic press. So much less messy than mincing the garlic with a knife. Easy Accent Decorator. Deviled eggs are filled quickly and cleanly – hooray! Long handled tongs. I use them for everything – turning foods, picking up steaming ears of corn, tossing spaghetti and more. Towel Rack. I hate having kitchen towels on the counter or draped over the handle of the stove. My wooden towel rack (pictured above, actually) is mounted in a very convenient location and I love it. Microplane grater. Lemon zest and lemon zest and shaved Parmesan cheese in a snap. Citrus squeezer. The best for fresh squeezed lime (or lemon!) juice – makes pico de gallo so fast and easy. Steamer basket. I use it constantly for fresh veggies. Adjustable measuring cup. The one I have is buy Pampered Chef and you push the inner tube up and it forces the food out. It’s great for peanut butter and shortening. Kitchen shears. Like the tongs, I use them for everything from cutting up chicken and pizza to cutting lengths of string. And then I throw them in the dishwasher. Perfect. How about you? What are your favorite kitchen gadgets? Make sure you add your link below if you wrote a post for Ten on Tuesday this week. If you want Ten on Tuesday emails every Monday then click here to sign up. gadgets that multi-task are my favorites…and then there’s the melon baller. I really love the little balls but have yet to find another use for it! I need to look for one of those towel racks. I hate having mine on the handle of the dishwasher. 2) Garlic press- though I have been doing more chopping of garlic lately. 3) Stick blender- use it for pureeing soups in the pot. I sadly killed the poor thing finely grating parmesan cheese for my pesto last week using the chopping/ processing attachment. 🙁 It was old and lived through 2 floods. 5) Tiny wee mini- processor with base- holds about a cup and I use it to finely chop herbs and nuts or to make garlic, herb butter spread. Have had it 20 years and it’s still plugging along. Also lived through 2 floods. 6) Chicago Cutlery Chef’s knife. I love the thing! No other knife has even come close to it. The handle is wood and has the right feel and the blade is the perfect length. I’ve tried others (Henkels) since and they pale by comparison. I have a Japanese ceramic knife that slices like a razor, which I love. And a large All-Clad sauté pan. Everything seems to taste better cooked in it. Immersion blender, microplane, salad spinner, cherry pitter, anf although it is not exactly a tool, I hace fallen in love with parchment paper! French rolling pin, Bullit Blender, pie crust rings. I’d rather keep gadgets to a minimum but I like my microplane, a good wooden spoon and, just recently added, a silicon spatula. I like the towel rack. My husband constantly leaves wet towels on the butcher block and it drives me crazy. I may have to go get one of those! It holds the zip lock bag upright and open while I cut up whatever to put in the bag- ‘specially good for cut up meat that you intend to marinate. It folds flat to fit in a drawer too. I like my wine-foil cutter thingie too. Great topic Carole! I forgot my paring knife! I’d be lost without it. And I love that towel rack! 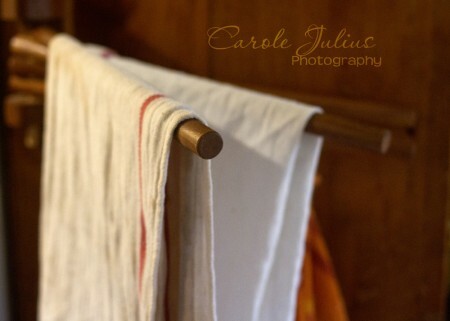 Country cloth towels are the best! I’m surprised you didn’t include your pastry cutter.